Workplaces are being confronted with increasing claims of bullying according to Industrial Relations tribunal statistics in Australia. It is surprising to note that in Australia there is no common definition or statute law covering bullying or related cyber-bullying. In terms of the law one finds that certain types of bullying behaviours such as stalking, assault, threats etc may be covered by other actual statutes and laws that relate to the immediate type of activity. In general one finds that Bullying is covered under the implied conditions that a workplace should be a safe environment for the staff involved at that workplace. Occupational Health and Safety Laws provide some guidance in this area. In a typical workplace today one routinely finds workplace policies for internet and email usage, harassment, racism, and discrimination policies. These policies also cover workers from bullying and cyber-bullying that could occur using those themes and mediums covered by those policies. It is less common to find actual Bullying and Cyber-bullying policies but these too are now emerging to define and inform for workers what is and is not condoned in the workplace with respect to interpersonal behaviours between staff. 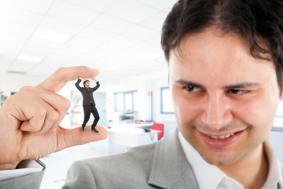 What is important is that employers must take the issue of workplace bullying seriously. The documented effects of bullying on the victim and the bully are quite pervasive and potentially far-reaching. Victims have been shown to often suffer trauma that equates to Post Traumatic Stress Disorder, and may have associated Anxiety, Depression, Psycho-somatic illnesses, and psychological disorders including impulses to suicide. The bully often has a pattern of controlling, intimidatory and anti-social behaviours in their history and will normally found to have low self-esteem and poor self and body images. They may have been bullied themselves in their past, and bullying is often either an attempt to overcome their felt sense of powerlessness in life, or their mal-adapted way of social engagement. Bullies are often depressed, anxious, confused and may also exhibit physical and mental health issues and symptoms. The employer suffers from the fact that their workplace becomes unsafe and less cohesive in the face of the bullying behaviours. Studies have shown how productivity drops, absenteeism rises, staff turnover increases, and morale slumps over time if the issue is not confronted and dealt with. Remember that bullies typically have low self esteem and feel powerless. They typically compensate by trying to move higher through the workplace ladder and get placed in positions of power and control, which legitimises their need to use this authority in a dysfunctional way. The employer also suffers as increasingly staff are seeking recourse to the law to fight workplace bullying when employers are seen to ignore, or dismiss bullying by their staff against another colleague. As an example, Worksafe W.A. defines workplace bullying in quite broad terms. It is described as: “repeated unreasonable or inappropriate behavior directed towards a worker, or group of workers, that creates a risk to health and safety”. The Workplace perspective orients itself towards the potential adverse effects on the workplace health and safety for staff and subcontractors or agents of the business. Employers need to understand that if they turn a blind eye, or minimize or dismiss instances of workplace bullying then they run the risk of incurring expensive litigation costs in various courts and tribunals that an affected staff member may take legal action through. More importantly employers now need to understand and enact workplace policies that describe and guide employee behaviours around Cyber-bullying. Cyber-bullying is a serious topic because its effects on the psychological health of victims is more far reaching, lasting and damaging that the traditional physical bully. Cyber-Bullying is a new concern as the tools and nature of the internet mean that any content, once transmitted and posted, can never be guaranteed to be fully erasable, deleted or removed. A rule of thumb is that what is put on the internet remains there forever. In the past a victim ceased being bullied physically once removed from the presence of the bully. Although harmful there was limits to the effect of bullying via physical avoidance or absence of presence. The audience of bullying was often small. The nature and problem of Cyber-bullying is that one is exposed for eternity to a worldwide audience when one is subject to malicious comments, rumours, shaming, exposure or attack on the internet, particularly when conducted on social media sites such as Facebook, MySpace, Twitter and YouTube. Victims of cyber-bullying and the related phenomena of cyber-stalking, suffer more than victims of “traditional” bullying. The inability to escape from the 24 x 7 online world, coupled with the public nature of threats and humiliation resulting from posts on the internet, made electronic bullying more intense. 4 out of 10 women suffered electronic harassment after dating using online dating sites. 20% of prosecuted online stalkers used social media and social networking sites as part of their modus operandi to stalk victims. Online bullying and stalking is under-reported and likely to increase as more people become social media “savvy”. Psychological studies are showing how a class of people with anti-social mental disorders, and other people who feel confronted with physical interaction, are starting to live “virtually”, or increasingly locked away from true social interaction, in front of computers and mobile devices. A generation is now emerging who have been raised on these devices and technologies. Neuroscience has shown how the internet and social media experiences such as Facebook interactions are highly addictive for some people. As a consequence of the damaged nature of some individuals in their personal histories, plus the explosive trend of the internet as a replacement or compensation for social engagement, a general social trend is emerging for remote interactions and connections that transcends workplace boundaries. This does not lift the burden of responsibility away off the employer. An employer can be found responsible for the online practices done through the workplace supplied internet and social media enabled technologies and devices. Likewise the internet becomes the new “cyber-playground” where the bully can show up and torment others. Employers are not outside their duty of care to employees when one employee bullies or abuses another through one of the many gateways into the online world. Employers need to be pro-active and amend or introduce updated workplace policies that provide a cohesive and linked framework of guidance, education, definition, and policy or rules that proscribe and set boundaries around personal and online presence and behavior. Whilst an employer cannot directly control the actions of their employee they can certainly articulate the physical, behavioural, cultural, online and value driven standards, rules and mores that are expected of all that would work under the banner of that workplace. Employers that continue to omit or neglect to introduce or update doing so are increasingly running the risk of ending up in a litigation linked outcome that can only result in the risk of heavy cost, and damage to the reputation of that business. Corporate Energetics regularly consults with employers on the matters of workplace bullying and cyber-bullying, as well as running our “Standing Tall” Anti-Bullying/Cyber-Bullying programme. Contact Richard Boyd to find out more how he can help you to proactively introduce relevant email, internet, harassment, racism, bullying and cyber-bullying workplace policies, or Employee Assistance Programs (EAP) to assist staff who have alleged bullying in the workplace. Richard also personally assists and provides coaching to managers, supervisors and executives in the workplace who find they have bullying tendencies in their personality that are getting in the way of discharging their leadership roles to optimum success.